Cycling team Katyusha have added yet another Spaniard to their ranks, with three-time World Champion Oscar Freire agreeing to race for the Russian outfit from next season. ­The 35-year-old was reportedly considering retirement after a lackluster 2011, but instead has swapped his previous Dutch team, Rabobank, for Katyusha. 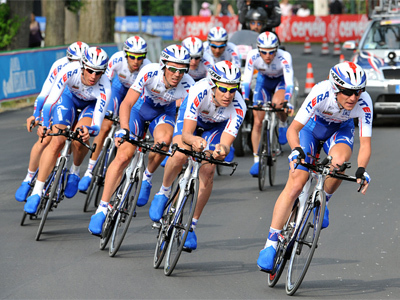 He joins fellow Spaniards – Joaquim Rodriguez, Daniel Moreno and Alberto Losado – in the Russian team. Chief of the Russian Cycling Project Igor Makarov believes the Spanish rider’s experience will be very good for the Katyusha team. “In the world of sports, Oscar is one of the most impressive riders of the last decades,” he said. “I think he will provide a huge influence to the development of young riders of Katyusha Team as well as to the development of the Russian Global Cycling Project. Freire is a sprint specialist, and has claimed three road race world titles, the last of which came in 2004. He also won the points classification at the 2008 Tour de France.